Before we headed to Los Angeles last month, Tawn and I were invited to a special foodie dinner held at Sra Bua by Kiin Kiin restaurant. 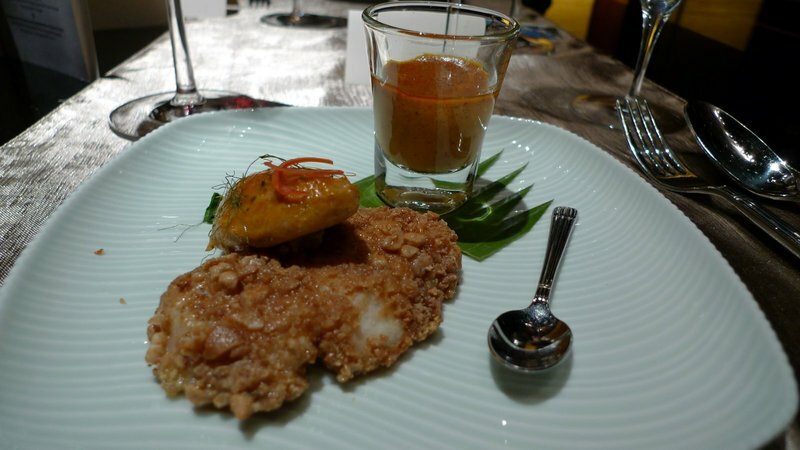 Sra Bua is known for its molecular gastronomy take on Thai food. Organized by CatAndNat.com, a Thai lifestyle website, and WorldFoods, I was invited to attend because of the writing I do for CatAndNat. 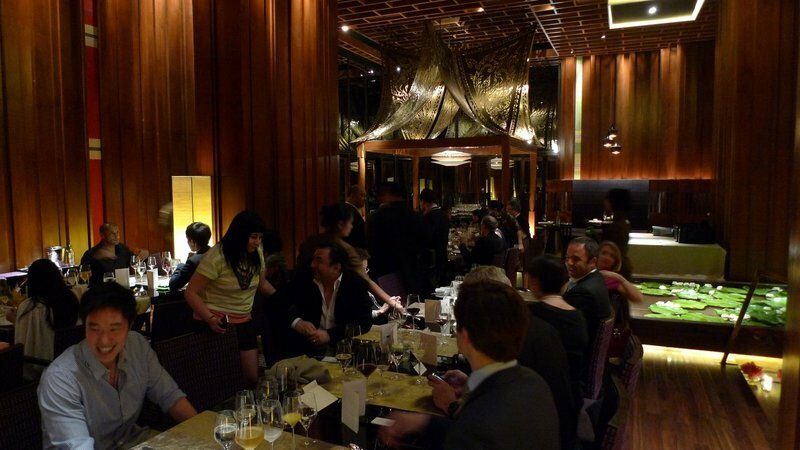 Dinner was held at the beautiful Siam Kempinski Hotel, tucked away right behind the Siam Paragon mall. 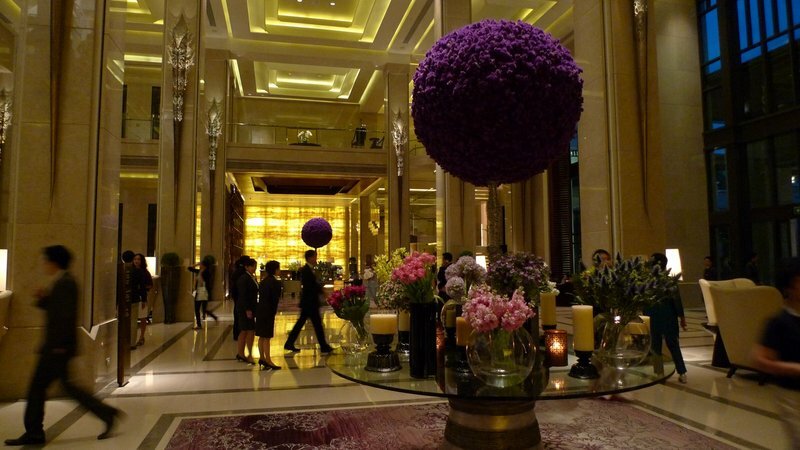 Opened less than a year ago, the Siam Kempinski is a beautiful 5-star hotel. 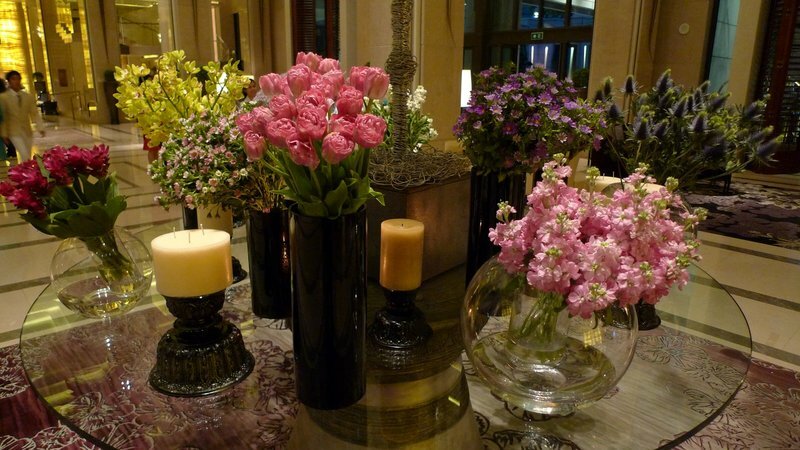 Their fresh flower arrangements in the lobby make it worth a visit just to “stop and smell the roses”. The building also features gorgeous architecture and decorations throughout. 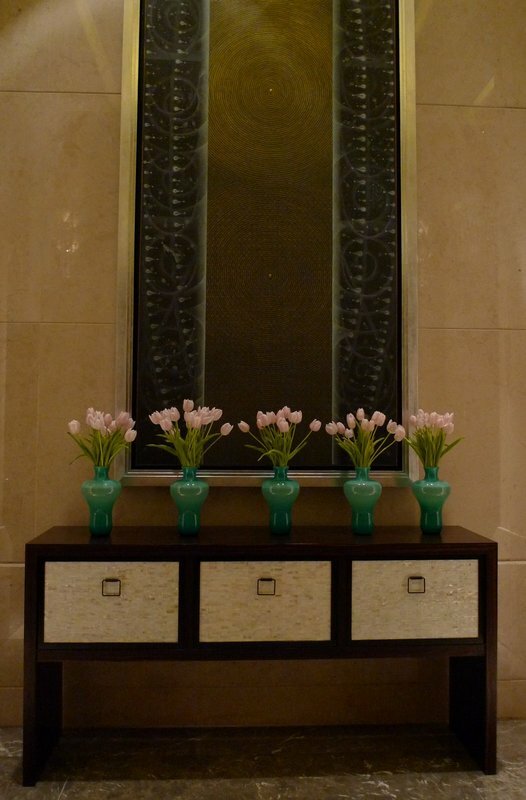 I enjoy visiting nice hotels like this just for the ambiance. 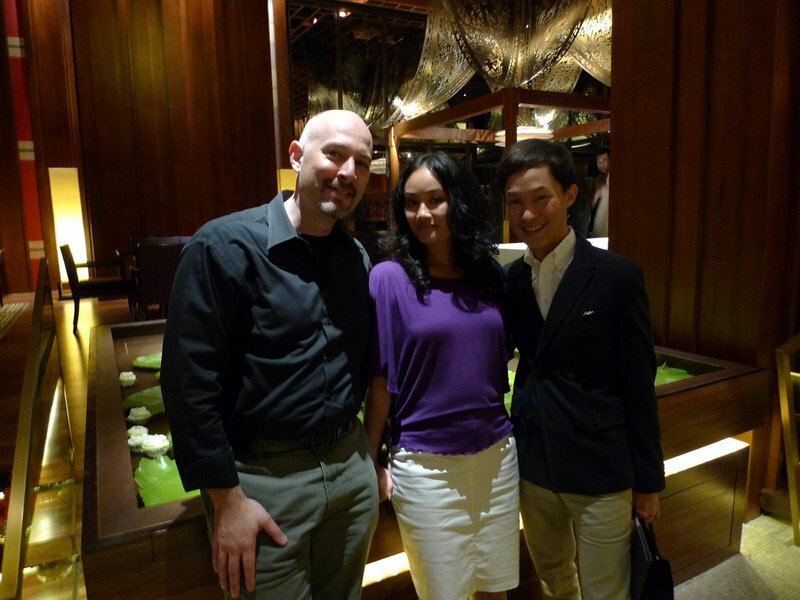 By coincidence, fellow blogger Angel and his partner were on holiday in Bangkok, staying at the same hotel. 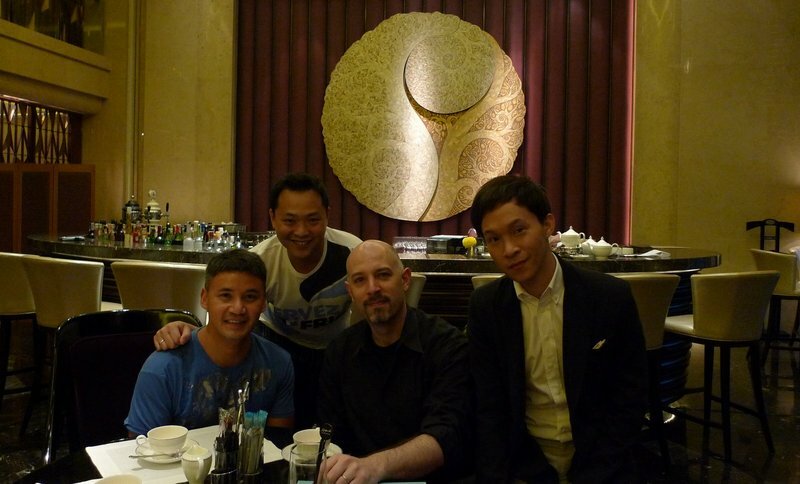 We were able to meet them for a late afternoon tea before proceeding across the hall to our dinner. Our host didn’t have Tawn’s full name handy so used my surname for his place card. Tawn was very excited as this is the first (and only) time after our wedding that he’s had my surname! 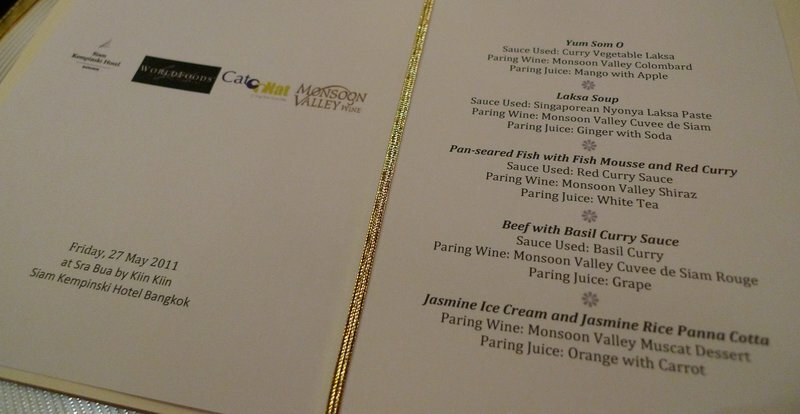 Each dish was made with a WorldFoods sauce and was paired with a wine from Monsoon Valley Wines, a local Thai winery. WorldFoods is a Malaysian based maker of high quality Asian-inspired sauces, marinades, chutneys, and pastes that previously has given me samples of their products and invited me to try and, if I like, to write about them. While I’ve been given no compensation, Tawn and I were invited to this very nice complimentary dinner. The restaurant,Sra Bua, is the sister restaurant of Henrik Yde-Andersen’s Kiin Kiin in Copenhagen, the second Thai restaurant in the world to receive a Michelin star (which I understand has since been lost). Appetizer – Yum Som O, which is a traditional salad made with pomelo. Pomelo is basically a large, less sour grapefruit. 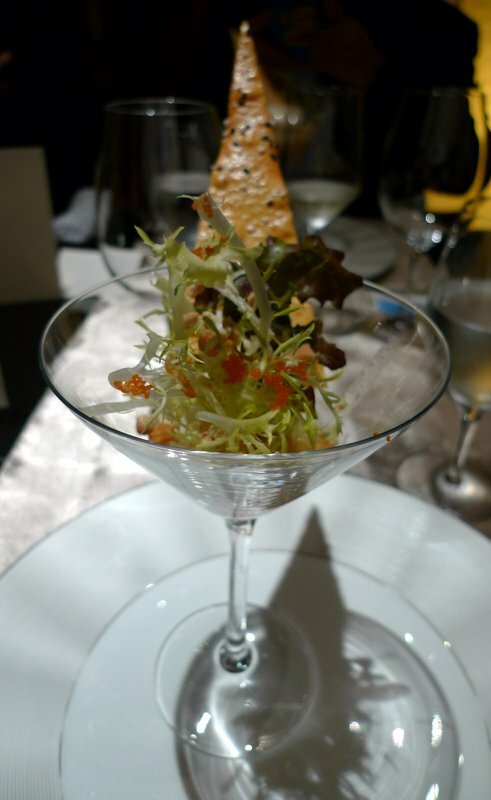 Here, the chef added frisée and fish roe, which was meant to have a similar texture to the individuals pulp sacs of the pomelo. Close up of the pomelo salad. This wasn’t much of a success, in my opinion, with too little pomelo and too much roe, which overpowered the flavor of the salad. The pairing wine was a Monsoon Valley Colombard, a fruity white. 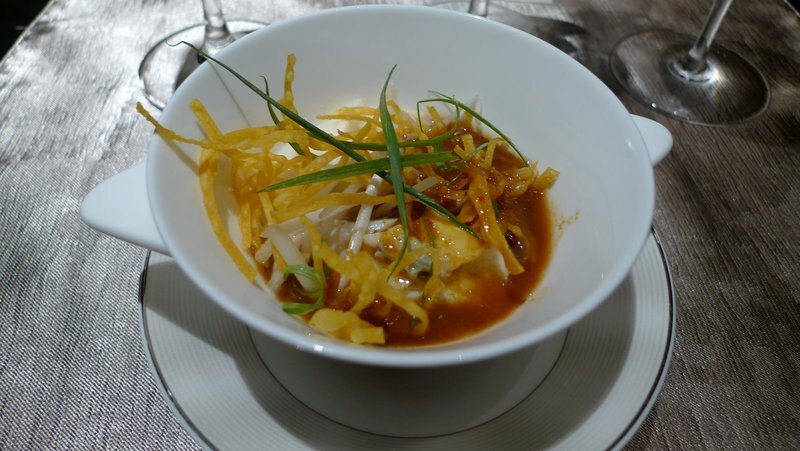 Next dish was a Laksa Soup, which used the Singaporean Nyonya Laksa Paste. This was a very pleasant, curry-type soup that was flavorful but not too spicy. It was paired with a Monsoon Valley Cuvee de Siam, another white wine from grapes grown in the hills above Hua Hin, a beach town about three hours south of Bangkok. The fish course was a pan-seared white fish (bass, I believe) with fish mousse and red curry. This used the Red Curry Sauce and is actually based on a classic Thai dish called haw mok, in which fish is pureed, mixed with a red curry paste, and steamed in banana leaves. I really enjoyed this course. It was paired with a Monsoon Valley Shiraz that was pleasant, although not very complex. The highlight of the meal was this beef with basil curry sauce. 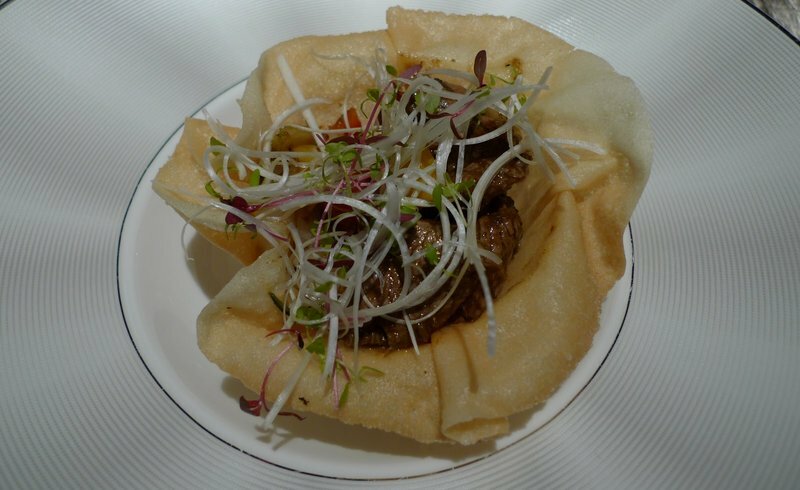 The chunks of beef couldn’t have been more tender and it was served in a lightly fried pastry shell that is balance (although you can’t see it) on a small mound of jasmine rice. This dish was so good that Tawn, who rarely eats beef, had the whole thing. 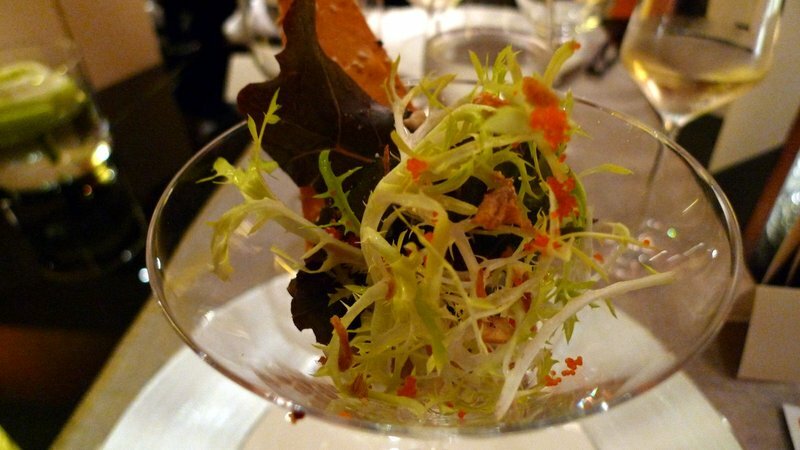 It was paired with a Monsoon Valley Cuvee de Siam Rouge, which was also the highlight wine of the evening. It is a blend of 70% Shiraz and 30% Sangiovese grapes and has nice fruity flavors without too many tannins. 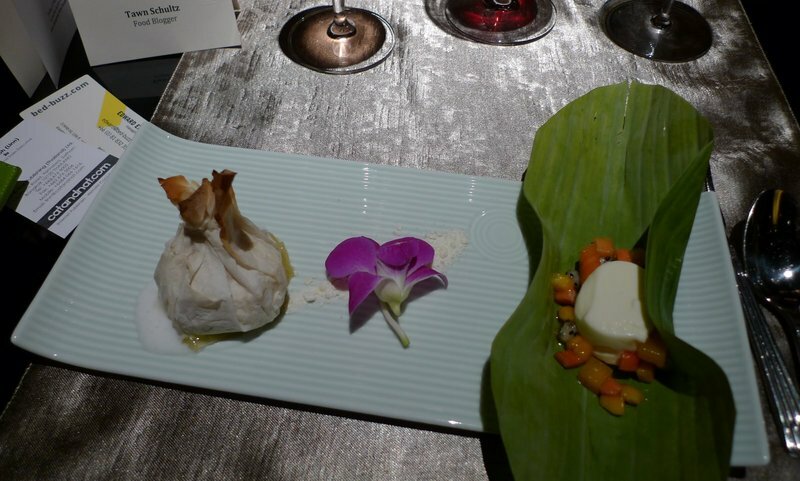 Dessert was a jasmine ice cream served wrapped in phyllo dough and a jasmine rice panna cotta served with mixed tropical fruits, wrapped in a banana leaf. These were really nice as the flavors were very delicate and refreshing. The wine was a Monsoon Valley Muscat Dessert, which was sweet and syrupy. After dessert a variety of hand-rolled truffles were set out. 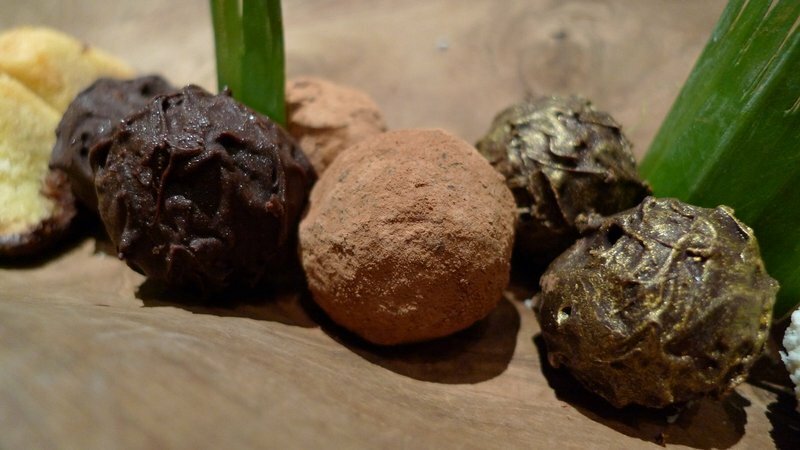 If you like chocolate, you’d like these! Me and Tawn with our friend Linda, who was able to join us at the last minute for dinner. Conclusion: the menu, which was specially prepared for the event, worked very well in some areas and less well in others. Attention to detail in the preparation was very high, though, as was the quality. Service was also very attentive, which of course can be a challenge when you have some 30-40 diners. Kudos to the chef and staff of Sra Bua for pulling this off. 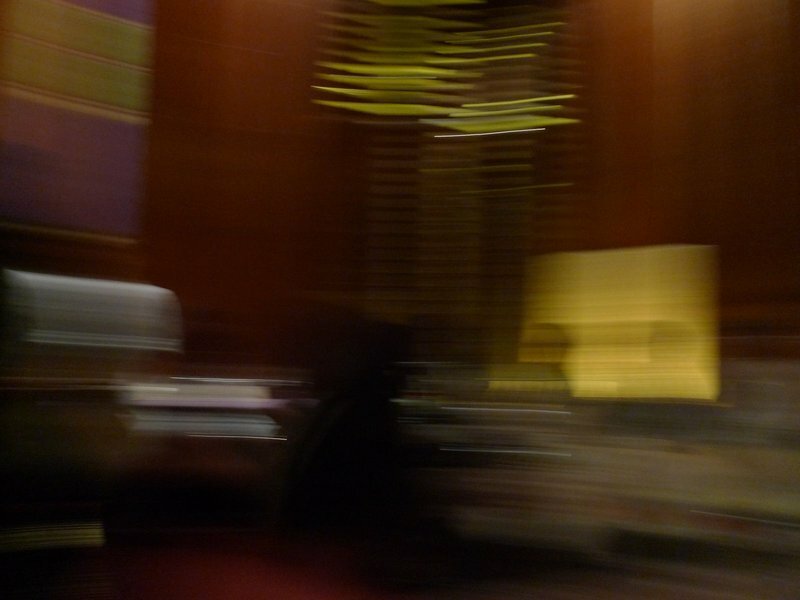 This entry was posted in Uncategorized and tagged Bangkok, Bua, Dining, food, hotel, Kempinski, Kiin Kiin, Michelin, Siam, Sra, SraBua, thai, Worldfoods by christao408. Bookmark the permalink. Unique kind of food. Tell me, how did you feel at the end of the meal, satisfied ? Portions looked so small. You are right about the attention to detail. And the food presentation is very pretty too! I was inclined to try this place but realized about the dear price! Looks so good. I am glad you were invited there, so at least I could virtually taste the food with your expert description. I think Tawn will hang on to the Tawn Schultz place card for the rest of his life. That’s just too cute Chris! It does look very hoity-toity! 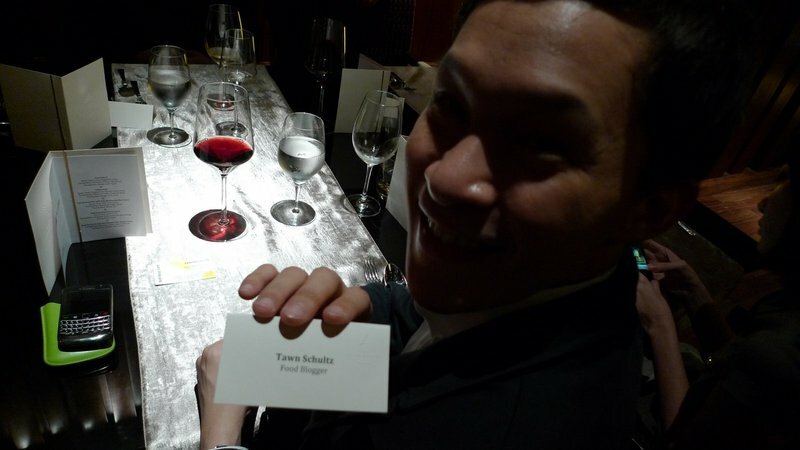 Glad you enjoyed it (even if the highlight was Tawn’s place card!). @The_Eyes_Of_A_Painter – Good question. It reminded me of meals I ate, for example, in Paris. Portions were small, courses were spread out a bit, and there was a lot of other points of satisfaction besides just taste and quantity. For example, the food was visually appealing, intellectually stimulating, and of course the environment was pleasant and the company and conversation enjoyable. All of these resulted is a feeling of satisfaction but not of being “full”. I suspect, though, that if we all focused on being satisfied at the end of a meal rather than being full, we’d be a lot healthier! @ZSA_MD – The place card has probably already been locked away in some box of treasured items! @CurryPuffy – Yes, the price is up there and I often feel that with Thai food, paying more isn’t a guarantee of enjoying it any better. That said, they do something very different there than at most fine dining Thai restaurants, so perhaps it would be worth a try on your next visit. I always enjoy reading your blog – whether it’s about food, relationships, family, friends, flying, Tawn, travel or life in Thailand. I just wanted to let you know that. @ElusiveWords – Oh, thank you Matt. I think I knew that already, but it is nice to hear it from you again. @murisopsis – Small pieces of paper can sometimes turn into the biggest deals, can’t they? I am more interested in Thai politics than Thai food. Sorry, I don’t mean to offend. Just an opinion. Would love to try the Jasmine Ice Cream dessert! @brooklyn2028 – Sheldon! How have you been? Yes, the Jasmine ice cream was lovely. @yang1815 – He loves you, too, Andy. @marc11864 – Ooops, all gone, Marc. Sorry. @Dezinerdreams – The presentation was one of the highlights, Vivek. @ClimbUpTreesToLookForFish – An opinion that is certainly welcome. @christao408 – I’m well…just swamped with work but finding time to relax too as you can see in my latest post. 🙂 I’m trying to keep up with Xanga as best as can too. Always love reading your entries!